I have come across quite an interesting tool – LiteManager, which, in my opinion, can compete with more famous counterparts in the market of remote support and management solutions. 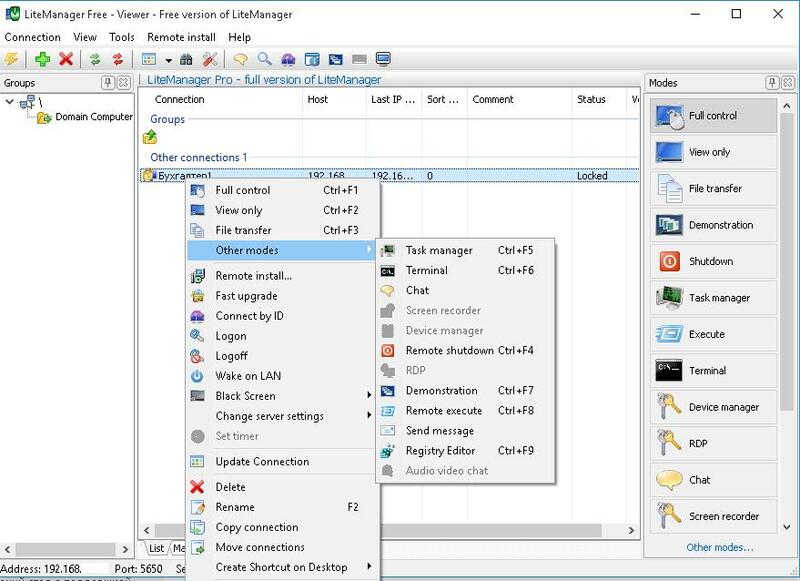 Using LiteManager you can remotely connect to a user computer from the local network, Internet (including users behind NAT), interact with it, control the computer and its processes, install software, make presentations and record user activity. Let’s consider the basic features and architecture of LiteManager. You can download LiteManager Free version from http://litemanager.com/. Note. The free version has a number of restrictions: the maximum amount of remote clients is 30, and its functionality is a bit truncated (not too much, however). 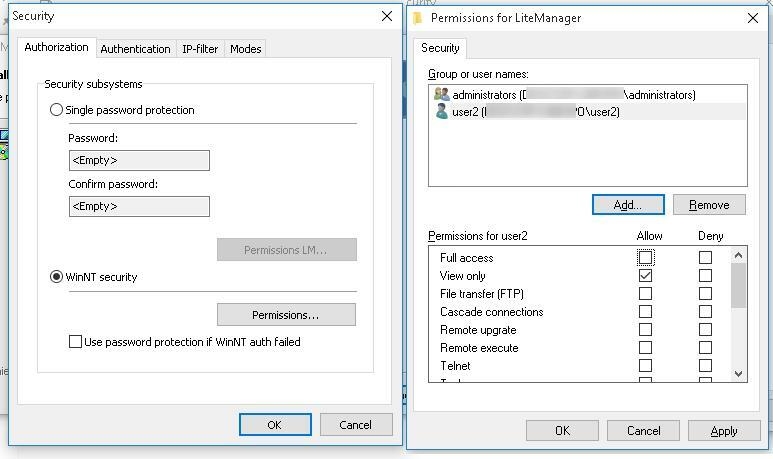 During LiteManager Server installation you can select the authentication type to connect to a computer: you can use either the integrated LiteManager authentication or the Windows authentication. It’s worth to note that you can granularly define which connection modes are available to the different users and groups. For example, the Administrators group has full control privileges, while HelpDesk domain group need user confirmation to connect. You can also set the level of encryption, the filter of allowed/ forbidden IP addresses and the list of prohibited connection modes. 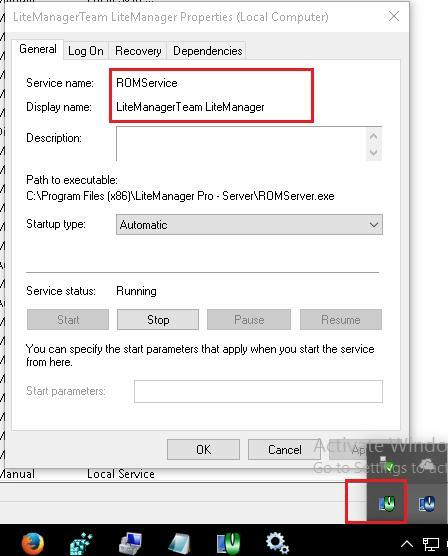 After the server part is installed, a new service, LiteManagerTeam LiteManager (ROMServer), appears in the system, and the application icon appears in the system tray, thus you can access its settings (you can lock changing the settings by common users). Now switch to the second computer having LiteManager Viewer installed. Run ROMViewer.exe and add the name/ IP address of the remote computer you have installed the server part to. 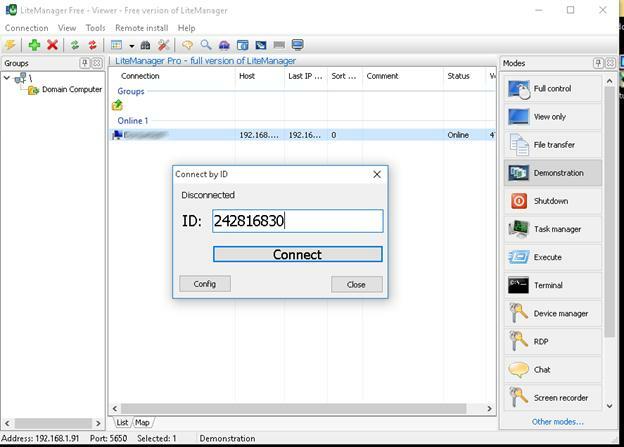 You can connect to a remote computer using the client ID through LIteManager server on the Internet, similar to the TeamViewer connection. This type of connection is useful when working with clients behind NAT (gray IP addresses, etc.). 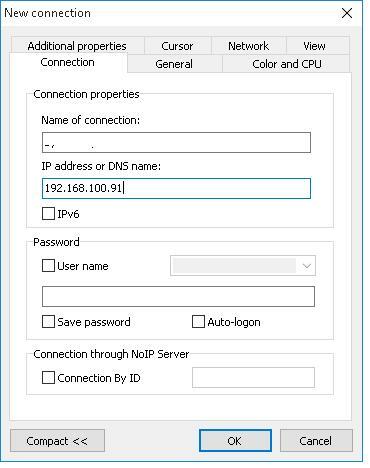 You can configure your own server to manage and connect to the remote computers using their IDs. (In this case, all connections go through your server instead of LiteManager servers.) In LiteManager terminology, this server is called LMNoIpServer.exe (NOIP), it also comes in the LiteManager distribution package. This server part has to be run on a computer with a white IP address, which is later specified in the settings of LiteManager clients. It allows to connect the Viewer and the Server without specifying their IP addresses. This connection type will also suit isolated networks (without access to the Internet). According to the information provided on the developer’s website, using the own NOIP server with a fast channel will significantly increase work speed and response time. Note. I tried to reduce the bandwidth to LiteManager client to 56 Kb in using VMWare vSwitch Traffic Shaping. As the result, in 16-bit color mode remote desktop image did not get slow. So, it is safe to say that the program will work on almost any network channel. Now you can connect to a remote client. LiteManager offers quite a wide collection of options to interact with the remote computer. 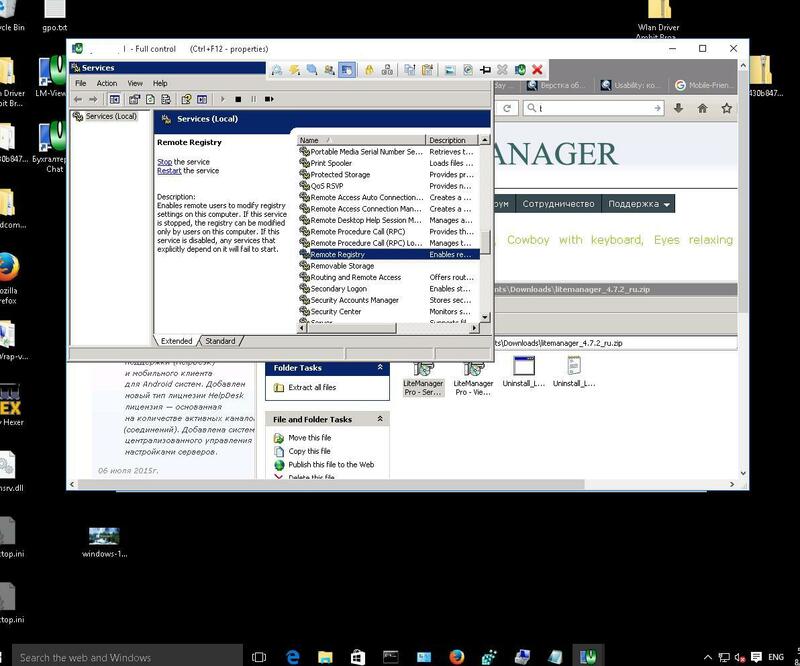 On the snapshot below, you can see the desktop of a remote computer, to which we have connected in the Full Control mode (desktop view with control over the keyboard and the mouse). You can connect to the client with no need to install the full version using QuickSupport mode (like portable version of TeamViewer). It’s enough to download and run ROMServer.exe (or ROMServer_user.exe – if a user does not have local administrator privileges). It’s worth to note that there are LiteManager versions for IOS, Android and Mac OS. On Linux LiteManager Viewer has to work from Wine. HelpDesk license – active channels are licensed. This type of licensing suits the companies providing remote support to the third-party users. 1 license allows an operator to work with any number of computers, but with 1 computer at a time (1 channel). The 1-channel license costs $300. It turns out that LiteManager license will be two or three times cheaper than that of the competitors: TeamViewer, Ammyy Admin or Radmin. In general, LiteManager is quite a functional tool with a wide range of settings and options of remote user management, which help to configure and use the product according to the needs of the most demanding customer. The program can be used to work with computers in a local network or in the Internet, remote connections to the computers by their IDs and systems behind double NAT are possible. Lower price of the licenses compared to those of the similar programs allows at least to consider LiteManager as a candidate for the main remote support software.